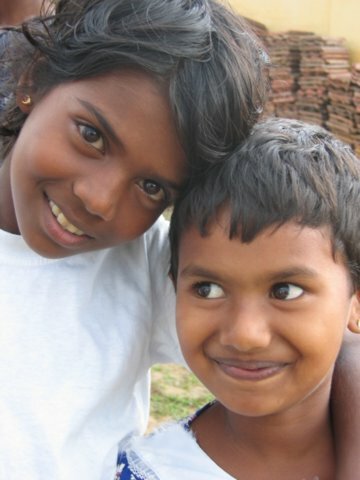 We meet several children and I get them all smiling and laughing with my digital camera. They love seeing their image on the screen and I promise to send them prints when I get home. It is wonderful to feel some joy from them and see the resilient human heart at work. One of the girls (wearing dark blue in this photo below) lost her father and her mother is in Saudi Arabia working as a maid. The “employers” refuse to let her mother return until her contract is finished so the girl is alone and may not be able to continue with school. Another girl (wearing pink) lost seven immediate family members. Her brother came to us asking if we could help his sister–she wakes up screaming with nightmares almost every night. I take pictures of these lovely smiling and happy faces knowing what must lie just under the surface. In talking with the school staff, we come up with a plan to connect these school children with American school children. There are about 102 children at this school from Kindergarten through 10th grade with 10 staff. They need everything from clothes to text books to health care (most of these children are quite small due to malnutrition). We calculate the cost at about $50 a month per child. Some parents are too poor and need their children to work rather than attend school. Also, girls are often taken out of school to be married at a young age or sent to other countries as domestic help for the family’s financial needs. 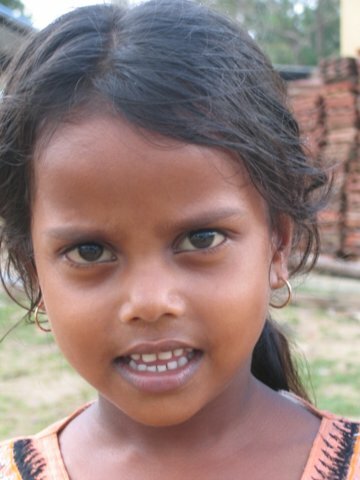 We will be working to help girls reach graduation and secure a better quality of life through education. As I said, we don’t know what we will find at the school or if we can even find what is left of the school or its staff. Over the next hour our volunteers map out a plan of what is needed and begin taking a human inventory of the children’s ages and possible medical needs. One six-year old boy is brought to our medical volunteer because he can’t hear. During the disaster, he slipped from his father’s arms and luckily his father was able to step on him and hold him to the ground under water until one of the waves passed. Somehow he lost his hearing but he is alive. I can’t see to get a smile from him for this photo. Another boy is quite ill having swallowed and inhaled a large amount of sand and seawater. The available medical help so far has not addressed this level of care. Later we meet up with a team of Australian and Danish doctors (accompanied by a Vietnamese monk who runs a monastery in San Jose–I’ll catch up to him later in the States) and direct them to the two boys. After the meeting, I ask the principal to take me for a walk and show me exactly where the school buildings were because I can’t tell. We walk over to a large area of sand about a half mile inland. He says we are standing on the site of the main building. But there is nothing here–I ask again thinking I’ve have missed something in translation. Again I get the same answer and again I ask. Then he shows me this old damaged photo (still wet with smelly sea water) of the old building. 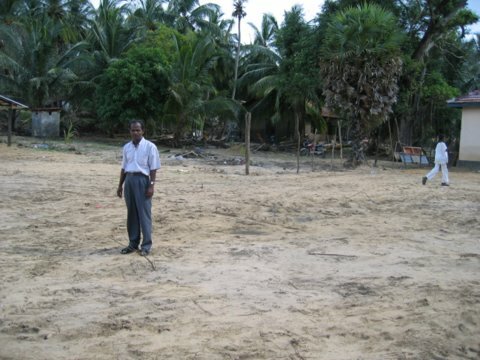 It is gone–without a trace–no foundation left, no debris of any kind–absolutely nothing! He shows me a tree where I can see the red colored leaves some 25 to 30 feet up–this was the high water line. The largest wave took the entire building, the entire library and left behind an eight foot crater of sand as if a building never existed. He says there are about 30 cars and trucks that have also vanished without a trace. 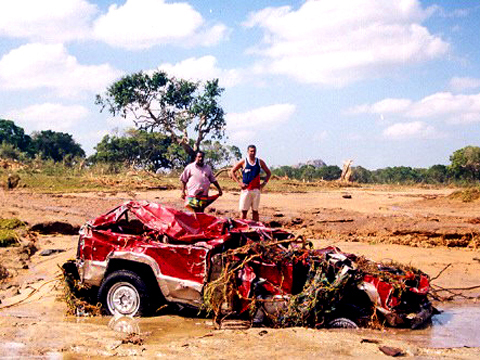 And of course there are many severely damaged vehicles but their owners cannot be found. We walk over to what looks like part of a foundation–this was the site of a new school building that was supposed to open in January. School started on January 17th under some tarps and tents but there are no books and no school supplies. “Help is on the way.” Ursula, a second grader at Arbor School (in Portland, OR) sent a lovely drawing of a tree by a river with these words. Today I’m taking this drawing and many others to the Panama region. We spent yesterday shopping for supplies: antibiotics, anti-diarrhea and diabetes medicines, dehydration packets, candy, crayons and drawing paper for the children, etc. We also hired a van and driver for the long journey and this was not easy. The first couple drivers we talked with said they would not take us to Panama because they were afraid. I’m not sure specifically what they are afraid of–another tsunami, what they might see there, Tamil Tigers, unknown road conditions, etc. At last we are successful in finding a “reliable” van. Reliable means that it has balled tires, 185,000 kilometers, the oil light is always on and there is a screechy sound coming from the engine that sounds like a tired fan belt. We are up at 4 a.m. and on the road for an unknown number of hours. We have a team of seven volunteers including Jeewa who is a wildlife officer stationed in Yala National Park. Yala is on the east coast next to Panama. Jeewa has worked at the park for 10 years and seems to know everyone from here to there. His ranger station was destroyed on the December 26th. He has arranged for us to stay at another wildlife station just a couple miles inland from Panama. During the eight hour trip, we encounter a number of obstacles on the road–mud & rock slides, elephants, monkeys, cattle, omnipresent packs of stray dogs, pot holes (one is so large that we find an elephant hiding in it…just kidding), and perhaps the greatest challenge for me personally (since I’m in the front seat) is oncoming trucks and buses. We travel through lush cloud forests, high elevation lakes, and several armed security check points. The very long journey gives us all time to prepare ourselves emotionally for what we will be seeing and feeling today. 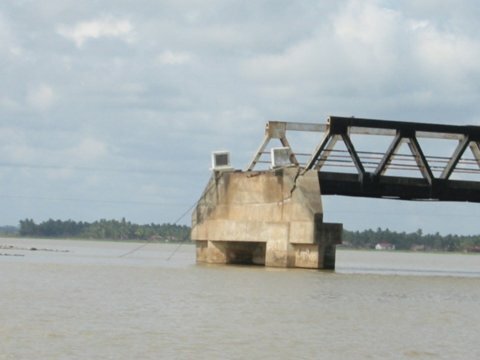 As we approach the end of the road, the bridge that would normally take us across Arugam Bay to Panama is half gone. The scene is like some kind of war time movie with several US military helicopters buzzing over our heads. We now have to walk to the military boat escorts crossing the bay. Jeewa knows all the fellows in uniform who have machine guns (and the occasional bottle of Sri Lankan whiskey) at their sides and he has arranged our crossing with the military commander stationed here. There are relief workers from all over the world milling about with supplies. We squint and cover our faces as a military helicopter lands almost on top of us. We board a raft operated by the Canadian military. A soldier asks me if I speak English. He has been here for two weeks and obviously hungry for some western conversation. He tells me that he has given boat escorts to people from all over the world but I’m the first from Oregon. He says things are getting better every day but the enormity of the work is overwhelming and all you can do is just keep showing up every day to do your small part. If this is the Canadian military view, I’m feeling like a grain of sand in this beached natural disaster. We reach the Panama side of the bay and pile into a military trailer pulled by a tractor headed for the local school. I catch the first signs of the devastation. It is one thing to see the images on TV and read the stories in the paper but we have crossed through the two dimensional media world view to feel the event through the hearts of survivors. And hearts are wide open here, both the open hearts of compassion from volunteers and the broken hearts of survivors. I’ve never been to a bombed out war zone but that’s the description coming to mind. There is also a feeling of unbelievable mysteriousness. It would be easy to understand if this devastation had been caused by bombing, but it is incomprehensible to imagine how the ocean could have come up some 25 feet and three kilometers inland. We don’t know what we will find at the school or if we can even find what is left of the school or its staff. More in my next update. translator & administration support volunteers. Our plan is to provide ongoing assistance over the long term to the specific east coast region between Arugam Bay and Yale National Park. Tomorrow a small team is going to attempt to reach this region. Although the only access bridge is damaged, we know a military commander stationed at the bay who is hopefully going to assist with a boat crossing. Once we reach the Panama area, we will deliver water purification tablets, flashlights, medicines, and emergency dehydration packets. We are also bringing drawings from Arbor School (in Portland, OR) children as well as paper, crayons, and candy. Our understanding is that their school was destroyed and our team hopes to meet with the school principal and teachers to establish an ongoing connection with schools and children in the states. The primary goal of the trip is to assess the ongoing and longer term needs of the community and develop plans to help rebuild. We will also be assessing the ongoing mental health needs of survivors. We have heard that there are children who will not leave the temporary shelters because they are afraid of the ocean. There are also people with diabetes and other illnesses who need to have their medicines, eyeglasses and hearing aids replaced. Many people are living in relief camps, however others have moved in with friends and relatives. The needs of these people are not easily assessed since they are somewhat unknown as survivors. Our team hopes to visit homes to see if there are survivors in need. I am very impressed with the integrity and compassion of this grassroots group of volunteers. This effort has no administration costs–just people to people. I’ll send you an update with photos when we return. Ayubowan from Sri Lanka. After a 38 hour (24 hours in flight) journey I touched down in Colombo with $25,000 in donations, enough water purification tablets to make some 6,000 gallons of clean water, and 70 pounds of flashlights. The flight was full of disaster relief workers and supplies. We were greeted by the government and taken to a special airport area to register and be escorted past customs. After a four-hour taxi ride I finally arrived at the home of Deva Ratnakara in the cloud forest area of Kandy. Deva is the president of Friends in Service to Community, the NGO that we are assisting. Most of the relief workers on my flight are headed to the south coast as far as Yala National Park. This area is more accessible and under government control. 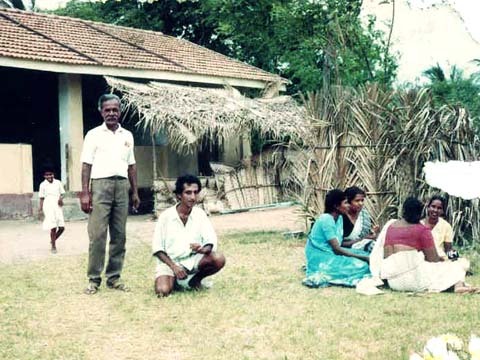 The east coast from Jaffna down to Arugambe is controlled by the Tamil Tigers. Damage in this area is somewhat unknown due to the lack of information being released by the Tigers. However, the east coast certainly took the greatest force of the wave. 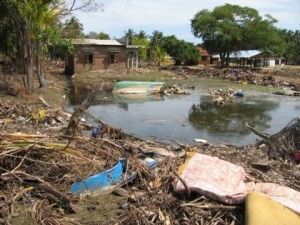 We are focusing our relief work on the small area just south of Arugambe and north of Yala National Park. The village of Panama is in this region of the east coast. There are a couple of logistical challenges to this region. First, the only access point was a bridge which has been washed out. The only way in at this time is by military boat or helicopter. Second, the Tigers have been taking relief supplies as well as children from disaster relief camps in order to resupply their agenda. 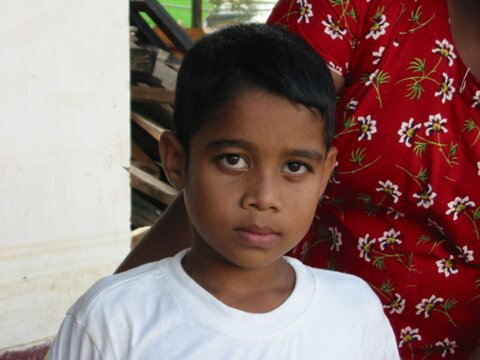 It is thought that the children are being taken to replace thousands of Tigers killed in the Tsunami. Just a couple days ago, Deva’s friend was bringing a semi truck load of relief supplies to the area when Tigers blocked the road with a tractor and attempted to take the supplies. A military officer was able to radio for help and the Tigers were scared off by a military helicopter. One of our relief volunteers is a wildlife ranger at Yala National Park and has immediate knowledge about the conditions in Panama. He will be at the planning meeting that we are having Thursday. I’ll know a lot more at that time and I can send another update. Thanks to all of you who have expressed your generosity and compassion. We are now close to reaching $30,000 in donations. I can tell you that everyone here is overwhelmed and extremely grateful. We will make certain that every dollar reaches the people in need. 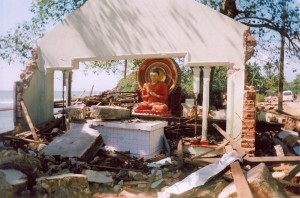 This is a photo of a Tsunami survivor residing on the east coast of the island. It is about 10 p.m. on Christmas day here in Portland, Oregon. I just checked the news on Google before going to bed and there has been a devastating tsunami that has hit Indonesia, India and Sri Lanka. I’ve emailed my close friends in Sri Lanka who run a non-profit organization with the message, “what can I do.” Without any logical or rational thought process, I know that I’m heading over to help in some way.